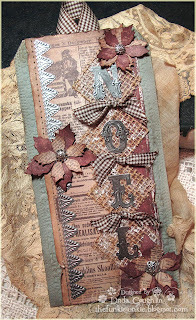 Funkie Junkie's 12 Tags of Christmas! I (again) chose to make a card. and the NOEL. So that's what I copied (the layout). I punched them out and added gems. Wonderful, love the background paper and the way you used the snowflake stamping arranged in threes. Great use of the mini blueprint snowflakes. Thanks of playing with me for week #4!